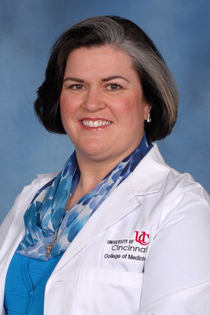 Dr. Kellie Flood-Shaffer is an Associate Professor of Obstetrics and Gynecology in the Department of OB/GYN at the University of Cincinnati, College of Medicine. She joined the faculty in August of 2008 after being recruited to the department to serve as the Division Director of General OB/GYN and Medical Director of the OB/GYN faculty private practice. She is a native of El Paso, Texas and a graduate of the University of Notre Dame with a degree in Anthropology. She received her MD from Texas Tech University Health Sciences Center (TTUHSC) and completed her residency training at the University of Texas Medical Branch in Galveston, Texas. Prior to joining the UC faculty, Dr. Flood-Shaffer served on the faculty of TTUHSC in El Paso, Texas from 1991-1997, University of Chicago/MacNeal Hospital from 1997-2001 and TTUHSC in Lubbock, Texas from 2001-2008 where she also served as Interim Chairman. She has been highly involved in resident education throughout her career and has served in the role of Residency Program Director at each of these institutions. In August of 2010, she accepted the position of Residency Program Director for the UC OB/GYN program as well. Dr. Flood-Shaffer has been active throughout her career on numerous hospital and medical school committees. She has served on the Executive Boards of the National Perinatal Association, the Texas Perinatal Association, the Texas Association of Obstetricians and Gynecologists in addition to holding office in the American College of Obstetricians and Gynecologists District XI Section 1. She is actively involved in clinical research and has published several articles and book chapters. She has received multiple honors and awards including several National and State teaching awards, Attending Physician of the Year, Texas Super Doctor 3 consecutive times and has been included in the Best Doctors in America 13 times and Cincinnati Top Doctors for the last 4 years. She was named Hospital Hero at the University Hospital for 2010. Dr. Flood-Shaffer is happily married to Dr. Michael Shaffer, D.O., and Director of the Sports Medicine Fellowship at Cincinnati Children’s Hospital. They have 3 children. Dr. Flood-Shaffer is fluent in Spanish and is skilled in minimally invasive gynecologic surgery, general obstetrics and gynecology, menopause medicine, breastfeeding medicine and General Women’s Health Care.